COZY AND FIT GREAT :Bonangel men\'s colorful art patterned dress socks pack fit men\'s size US 8-12 / EU 41-46.They are made of cotton and spandex. Fit you snugly but not tightly and the seams are well turned under ,feels like your legs are getting a nice hug! 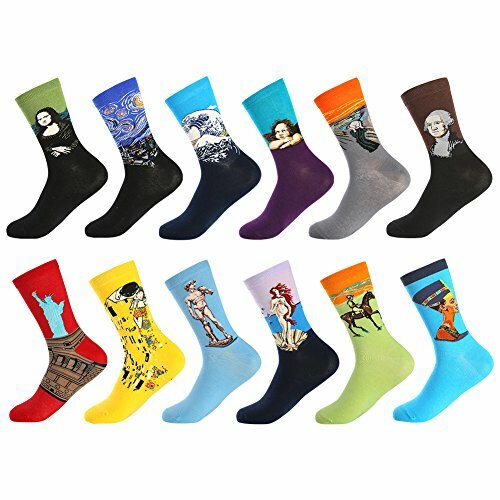 FABULOUS ACCESSORIES FOR MOST OF OCCASIONS:These funny crazy dress/crew socks are great to be worn as Daily Trouser Socks, Business Office Suit Socks, Sneaker Socks, Party Socks, Groomsman Dress Socks; Very easy to match your casual jeans, summer shorts, business outfits, or party costumes etc.And this is also a really good gift if you don\'t know what to get someone. EASY TO CARE :Our colorful fun socks are machine washable and non-shrink..They are still soft and comfortably snug , the colors are bright & true to the picture even after the first washing. SATISFACTION GUARANTEE :Our ultimate goal is customer satisfaction. In addition to the care for the highest quality products, we make every effort to ensure each client is happy with the shopping experience .If you have any problem with our colorful art dress socks,please feel free to contact us and we will give you a refund or a replacement.